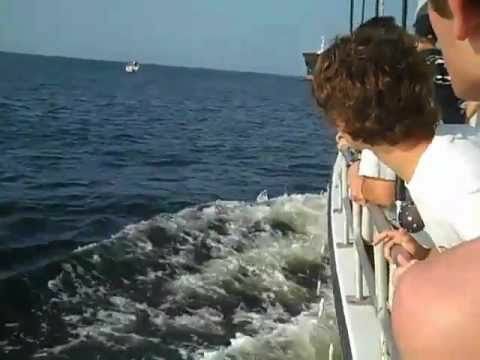 Now here’s a precautionary tale for anyone boating near a shipping lane. Anyone who’s ever crossed a shipping channel in open ocean can relate to the very specific feeling of being incredibly tiny in comparison to an approaching ship. So it doesn’t do any good to be in a stalled sport boat while a 50,000-ton Venezuelan tanker, Horizon Athena, bares down on your position at nearly 20 knots. The close call was caught on tape as a charter fishing boat moved in to help the stalled vessel. They no doubt watched with two things in mind: hope the tanker crew can follow directions, or hope that the pilot is able to move the massive ship just a few feet to one side to avoid a collision. Of course, a 50,000 ton tanker does not have really any turning radius at all: To hook a left for San Diego, for example, it would have to begin its turn somewhere around Hawaii. So when these sport fishermen noticed the impending collision and the stricken boat, they no doubt knew that if the tanker hit the craft, it would be blown apart like a balsa wood model, if it wasn’t dragged under the keel and then spit out through the screw. Such massive watercraft take around 20 minutes to come to a full stop, so that was not going to be an option. The only hope was to witness a near miss. As the tanker steams past, we can all see the gigantic power contained in such a vessel. Luckily, the tanker was far enough and slow enough that its passing was relatively uneventful. What we wonder, though, is why did the hapless sailors remove their life vests?